The Internet of things was a strong theme running through this years CES in Las Vegas. The idea that you can connect and therefore monitor and control your toaster or heating system has been the realm of hobbyists and enthusiasts for a few years now. Indeed, we worked on a project over five years ago to let you monitor your electricity usage and compare it online. Now with the likes of Hive from British Gas and Apple’s HomeKit, the promise of programmable stuff is becoming ever more common and it’s not just in your home, the internet of things is becoming increasingly mainstream. Retail is starting to roll out iBeacons to blend the real world with the digital, alerting you to offers and information about products as you walk past them. The ability to tie real things to information systems this way, has great potential not just for retail but for manufacturing as well. Bluetooth low energy aka Bluetooth LE, BLE, marketed as Bluetooth Smart is not a new technology but the recent adoption in smart phones (iOS 7 in 2013 was first) has lit the fuse for developers of software and hardware. Unlike the earlier versions of Bluetooth which were power hungry the new low energy requirements means the transmitters or ‘beacons’ can be miniaturised with battery life of many years. The Intel Button – shown at the CES 2015, contains motion sensors and is bluetooth LE compatible. 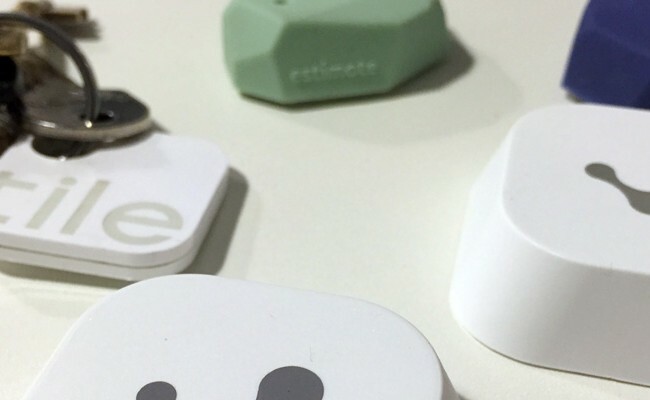 Over the last year there has been an explosion in beacons in various form factors from key fobs to stickers with different manufacturers aiming at specialist use cases. Part of the differentiation comes not only in the physical form factor but also in the management software and the organisational structures they apply. Beacons are tiny transmitters, dumbly transmitting their unique reference. When a receiver such as your Bluetooth LE capable smart phone comes into range, the message is received and actioned where appropriate. In practise developers make bespoke smart phone apps that only react to their beacons – otherwise your phone would be alerting you to every beacon it came across. Retail: Many examples – including those from manufacturer Estimote, show a retail environment where you can view content as you pass through the store and come into close proximity with beacons. For instance you may be able to watch a video on your phone of someone modeling the coat you are trying on or see technical details for the car you are looking at. Museum or gallery: This is a great example of the technology working in an environment where people are interested in localised additional information. We are used to audio tours and even using QR codes to launch web content for commentary on a painting or exhibit but the introduction of beacons allows this new layer of content to be delivered seamlessly to your smartphone..
Asset Tracking: Trackr and SticknFind have created beacons and a platform to track your lost property. Their beacons incorporate an audible alert which can be triggered from your smart phone. While this sounds like a good idea, tracking and location awareness with Bluetooth LE brings its own challenges and limitations. We will also be keenly investigating the Kontakt.io cloud beacon due out later in January- which acts as a bridge between bluetooth and the cloud via wifi. Wayfinding: Where you have 3 or more beacons in known locations you can trilaterate the receivers position. Careful configuration can result in robust, scalable wayfinding solutions like indoo.rs which has rolled out airport way finding projects for visually impaired passengers. Bluetooth is based on radio waves which are hard to work with. They bounce off objects, are absorbed by walls and can only provide signal strength – no direction. So when you are tracking an object you are only *maybe* able to tell you are x number of meters away – not which direction it is in – so you end up needing to walk around getting ‘warmer’. By having beacons in known places you can improve your chances of positioning the receiver using triangulation but it still requires some guess work. 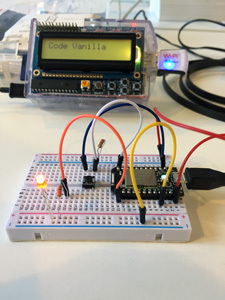 Code Vanilla are working on a number of exploratory projects around asset tracking and location-based information to enhance our TAG & Xpin platforms. We use Raspberry Pi and Spark.io ‘build-your-own-devices’ to examine and analyse interactions that get built out into meaningful experiences in our applications. These low cost – low barrier hardware solutions open up the door for fun, one off installations as well as large enterprise roll-outs – both of which we hope to have news to share soon. Last updated by Matthew Jennings at January 21, 2015 .